Nestled in the southern strip of Maharashtra, Malvan coast is known for its long sandy beaches, glorious sea forts, numerous water sport activities and the delicious Malvani cuisine. The narrow roads of Malvan lined with tall swaying trees, laidback air and small houses on either side portray the perfect picture of a typical coastal town. Beyond the trees, the powdery sands welcome you to the numerous beaches along this shoreline. 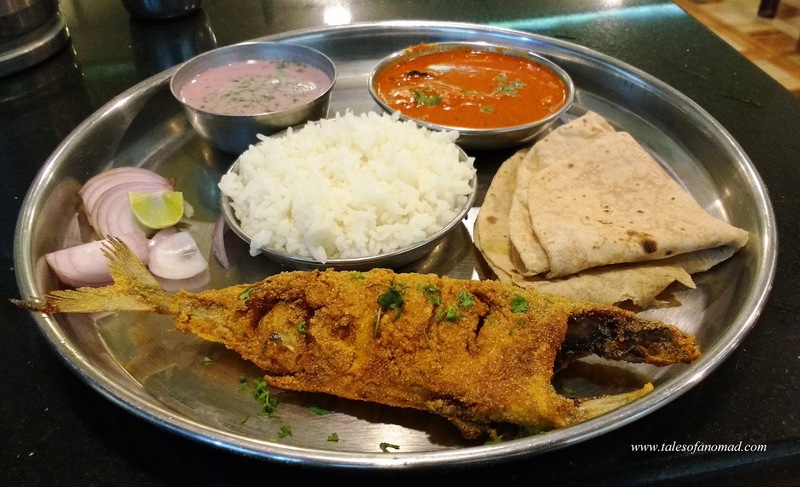 While in Malvan, stroll around, take a boat ride, go scuba diving, visit the forts and head back to the aroma of Malvani cuisine wafting from the nearby restaurant. Spread over long stretches, Malvan coast does have quite a few beautiful beaches and prominent forts to explore. This mid 17th century fort seems like a huge ship bobbing in the waters when seen from the Malvan beach. Built on Kurte island by Chatrapati Shivaji Maharaj to counter the attacks from European colonizers and Siddhis of Janjira, Sindhudurg fort is undoubtedly the symbol of the glorious Maratha empire. Spread over 48 acres, the tall fortifications and the strong bastions of this majestic fort houses three temples and is home to 18 families who are believed to be the descendants of the Maratha warriors. A walk around the ramparts of its outer walls offer magnificent views of the blue sea and the waves thrashing onto the walls. Near the entrance of the fort are the imprints of the hands and feet of Shivaji Mharaj preserved in dry lime. There are boats that drop you to Sindhudurg at frequent intervals from Malvan beach and they give you an hour to explore the fort. Rock garden is probably the most sought after place in Malvan to enjoy the setting sun. This neatly maintained garden offers the evening walkers an ideal place to stroll. However, what brings people here are an array of rocks that extend into the sea beyond the garden. It is an ideal place to catch gorgeous sunsets and enjoy the waters thrashing onto the flat bed of rocks. Perch on top of any protruding rock and watch the sky change colours as the sun goes down. Despite the commercialization, the most popular beach in Malvan has held on to its charm. The long arc shaped beach with coconut trees in the backdrop, a few colourful fishing boats and the azure sea encapsulates its visitors and is well recommended for an early morning stroll. Located a couple of kilometers away from Malvan, Kolamb beach is away from the highlights of Malvan. Apart from the local fishermen, a few bobbing boats and kids playing around, you are highly unlikely to see any visitors. The waves are pretty strong here and there is a sudden slope in the sands as you wade into the waters. The rocky outcrops to the right of the beach offer a beautiful frame against the blue sea. Past a few villages and numerous mango orchards, the narrow road leads to the crumbled Sarjekot fort where all that remains are a few stone walls. Totally in ruins, this can hardly be called a fort anymore. However, a walk through the insides of the fort leads to the mouth of Gad river where it joins the Arabian sea. Apart from the Sarjekot jetty and the colourful boats, the fort offers nice views of the serene Talashil beach across the river. As you ride down the narrow road that leads to Tarkarli, Wayari beach pops up without a cue. Also referred as Wayari Bhootnath beach, it isn’t quite a popular one and that keeps it away from the crowds. All that you can spot here are boats shored up, locals strolling around or a game of beach cricket. Tarakarli has over the years gained popularity on the tourist map and receives hordes of visitors during holidays and weekends. The beach here was once considered the most serene on the Malvan coast. The beach now is quite commercialized and offers numerous water sport activities for the visitors. Tarkarli is also a popular scuba diving location and is also home to the only marine sanctuary in Maharashtra. Further south of Tarkarli, the winding narrow road goes past numerous fishing hamlets and Karli river to Devbag beach. The narrow strip of land ends at this beach known for its heap of white sands and beautiful sunsets. The Karli river joins the sea here and across the river is the secluded Bhogwe beach. Very few visitors head to this beach and that makes it an ideal place for people who love leisurely walks and solitude moments. A two hour drive to the north of Malvan takes you to the prominent Vijaydurg fort. Built in the 12th century during the times of Shilahar dynasty, this impregnable fort was referred as the Eastern Gibralter. The fort was later fortified further by Chatrapati Shivaji who built the tall walls and numerous bastions. The ramparts of the fort offer majestic vistas of Vijaydurg beach, the blue sea and the waves crashing onto the strong walls. The fort houses four fresh water wells, banyan trees, temples and ammunition rooms apart from cannons and cannon balls. Devgad is primarily known for its innumerable mango orchards and are lined with shops selling the king the fruits during the months of summer. Also popular is the Devgad fort which presently constitutes of just the outer walls. A climb up the walls offers panoramic views of the sea. The fort also houses a temple and a 20th century light house. Located en-route the fort is the pristine cove shaped Devgad beach flanked by casuarinas and windmills. Located near Devgad, Tara Mumbri is a beautiful beach tucked away from the crowds. The rocky beach is known for the presence of phosphorescence which is visible as the sun sets. Numerous windmills can be spotted on the hills in the backdrop. The beach is situated at the mouth of a river with Mithmumbari beach across it. This coastal town is known for its popular Shiva temple that attracts numerous devotees during the festivities of Shivaratri. The temple with its colourfully painted tower is located by the beach atop a small cliff. Despite being a neat and serene one, the beach doesn’t get many visitors as even the pilgrims don’t seem quite keen on getting into its waters. That definitely makes a big reason to head to this idyllic hamlet. The stretch between Malvan and Kunkeshwar is home to some of the most serene beaches along this coast. Tondivali beach has a long sandy stretch with casuarinas in its background. All that you might spot here are a few fishing boats on the shore. Munge beach has a beautiful backwater near it which accentuates the charm of the place. Talbegad beach is probably the prettiest of the lot with an endless stretch of sand and swaying trees in the backdrop. The beach at Malvan offers numerous water sport activities such as parasailing, banana rides, jet ski rides etc. There are numerous operators who conduct these near the Malvan beach. While Tarkarli is popular for its scuba diving locations, Malvan too offers something similar near Sindhudurg fort. Though the operators claim this to be scuba diving, they take you to a depth of only 15 feet and the prices are alarmingly much lesser than what it is at Trakarli, which offers actual scuba diving. However, if you wish to just have a glimpse of the underwater world, the one at Malvan is a good option. After clambering over forts, strolls on the beaches and water sports, all that you would want is some delicious food to relish. 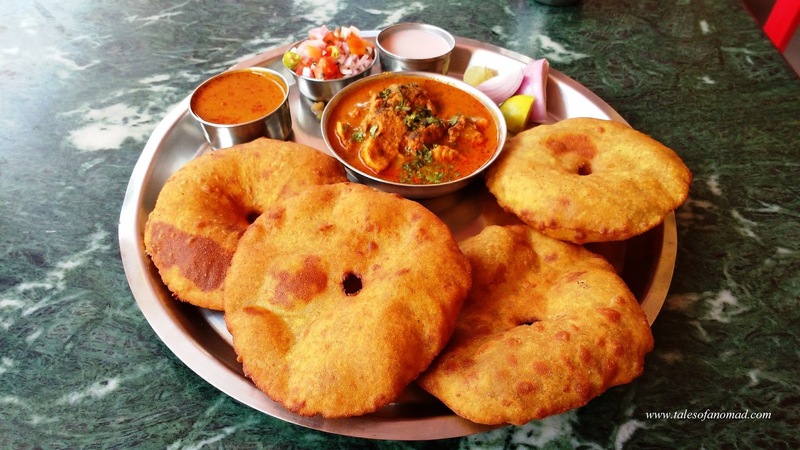 The delectable Malvani cuisine is easily available across the small restaurants in and around the beach and on the roads that lead to it. Thalis are available with various fish combos such as seer fish, king fish, pomfret, butter fish etc. A popular Malvani dish is Kombdi Vade which has Vade (made of rice flour and lentils), chicken curry and solkhadi. 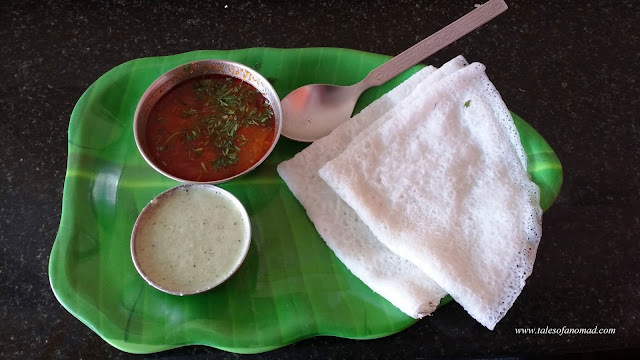 Though more of a Konkani dish, Ghavne which is similar to a Neer dosa is a delicious pick for breakfast. While returning from Malvan, take home a box of ripe Alphonso mangoes. Locally known as Hapus, they are widely available across the shops in Devgad and by the road side too. Mangoes are usually available only during the months from March to July. Malvan is located in the southern coast of Maharashtra, very close to Goa border. The closest airport is at Dabolim (128 Kms) and the nearest rail head is in Sindhudurg (28 Kms). There are frequent buses from Malvan to other towns such as Sindhudurg, Kudal, Sawantwadi etc. Wonderful account! I have heard of the fort, the place looks awesome...great images! Glad it rekindled your memories, Shilpa. Looks like you have explored every inch of Malvan! Amazing beaches and forts to explore and these are beautifully captured! Thank you. Though I covered a fair bit, there are many more secluded beaches in Malvan. Wow Excellent photo coverage. Some of them I have never heard. Wow, Beautiful coverage of Malvan coast. Nice pictures.